His anti-science record may help him with Republicans, but it'll probably do more harm than good in the general. Well, I hope it will. Thanks for a very interesting poll. I notice Ron Paul leads Jon Huntsman with moderates, 9-7. Being that Huntsman's candidacy for the Republican continues to be as laughable as ever it was, I sometimes wonder if he'll end up running for the Americans Elect ticket. The proprietors of that party have said they want a centrist who works across the aisle. Why do you make PPP look foolish by asking those questions at the end? 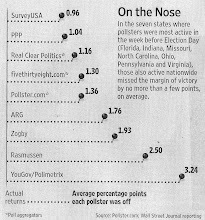 Nate Silver was on saying that it hurts PPP's credibility and possibly the viability of the polling results. I can't think of anyone better for Obama to run against than a guy who calls Social Security a ponzi scheme and thinks Medicare is unconstitutional. You'd have to try really hard to hand the elderly vote to Obama, but he's determined to do it. I wonder if Perry will be the flavor of the month like Bachmann was and then fade. Polls I have seen show that the citizens of Texas are not too fond of him as Governor. Once his record is more thoroughly vetted will he fall? I suppose the Democratic Party could attempt to make the election about evolution and global warming, instead of issues like the economy that Americans actually care about. It's their party. I just doubt it will be a winning strategy. See also Gallup polling on the number of Americans who believe in evolution. Creationism may be a fringe position in academia, but not in the public at large. Since 1976, when the Republican Party established its current primary system, the South Carolina Republican primary has selected the eventual nominee 83% of the time. Furthermore, the Republican primary in this state has picked the next President 50% of the time. On the rare occasions when Iowa caucuses and South Carolina primary both selected the same candidate, that candidate has been the party's eventual nominee 100% of the time. That nominee became the next President 50% of the time. However, this agreement between Iowa and South Carolina has only happened twice, so we're not exactly talking about a statistically significant indicator here. Well, that's an interesting but not ultimately that surprising a cross-tab. South Carolina Republicans who have a strong Southern identity (expressed as thinking it important that the Republican candidate be from the South) are overwhelmingly birthers, while those who don't think that the candidate necessarily has to be from the South manage to come out on the sane side of the equation by two points, 41-39. Meanwhile, Tea Partiers love them some Perry, but non-teabaggers are cool to him - though he still does second-best to Romney among the ones who have more than 70% name rec. Seems he's found a bit of a sweet spot, politically - far enough right that he can win over the crazies, but not so overt about it yet that he's turned off *all* the remaining non-teabaggers. The Democratic Party/Obama Campaign will make this into a CHOICE election not just a referendum on President Obama. It's a choice. Do you want a pragmatic intelligent President who is doing his best to turn this country around facing very difficult obstacles (including those put in his way by the Republican Tea Party) or do you want George W. Bush without the brains (Rick Perry)??? Rick Perry represents the problem, not the solution. I think the case for this can be made quite well because it's so obviously true. If the Republicans can find and nominate a "generic" Republican then yes they have a good chance of beating Obama - but the problem for them is there is no such candidate and even if there were he would never win the nomination. Also; Perry hasn't just said astoundingly stupid things about evolution & global warming (which I will agree the average voter doesn't care that much about - as the average voter is a bit of an ignorant fool unfortunately) ... but he's also said incredibly stupid things about SOCIAL SECURITY & MEDICARE. Most Americans are not going to vote for a guy who claims these extremely popular programs are "ponzi schemes" and "unconstitutional." I just don't see it for Perry. He very well may win the GOP nomination but I think he will make it very hard for the Republicans to beat Obama in 2012. PPP asked voters the importance of the nominee being from the South, and three-quarters said that was not an important factor. But among the 9% who said it was very important, 71% believe Obama was not born in the U.S., and 51% of the 15% who say the candidate’s Southernness is somewhat important deny Obama’s citizenship. The rest are split 41-39 in taking Obama at his word, as John Boehner put it. Draw conclusions as you will.